by Eric Brende. I’m really enjoying the book (expect a full review next week) and am very inspired to do a better job of making things from scratch and doing things myself. I’ve become a little lax in the last year as our income has increased and we’ve not been in such a position that we’ve needed to pinch pennies as hard. However, this book has motivated me to think outside the box and to be more proactive in looking for ways we can save money and use fewer resources — without expending a great deal of extra energy ourselves in the process. I guess it’s a new approach to the working smarter, not harder philosophy I’ve always had. So expect to see more do-it-yourself-type posts in the coming months as we experiment with new ideas. We’ve already written out a long list of things we’d like to try including making our own laundry soap (I know I said I’d never try again after my first attempt was such a total flop, but I’ve decided that maybe a new recipe might make a world of difference!). Speaking of which, I loved Tammy’s post today on . I think I’m going to make that mouth-watering chocolate cake to celebrate the completion of the P90X program (I must stop looking at the cake pictures and tempting myself as I still have around 70 days to go!). Do you have any other fabulous (and healthful!) make-it-from-scratch recipes you’d recommend or do-it-yourself ideas you’d love for me to try and blog about? Leave me a link or email me and I’ll definitely consider it! I don’t know what lake in Arkansas, but Lake Greeson is beautiful, hope you enjoy your trip!! We loved our long weekend, even though a little warm, loved family time and time away from TV, radio, internet and our cells phones didn’t work 1/2 the time – no reception, what a wonderful time we had. I don’t know if you are interested in a powdered laundry soap, but it is what I have had success with. Here’s a link to my recipe. I’ll have to check out the book you mentioned! Would you believe Yehoshua has been sick all week and we’re stuck inside again?! (Joshua has been working [actually studying] long hours.) I’ve been letting the kids watch educational stuff, but still. We need to work towards “unplugging” more! I just bookmarked your site- must make the Mocha Frappuccinos tomorrow! I bought instant coffee a few months ago for a recipe, and i’m glad i’ve found a way to use it up! I look forward to your upcoming posts in this vein. Definitely a goal I am slowly, slowly working toward, too. And thank you for the link to the make-it-yourself foods. Homemade cream of chicken soup – brilliant! I really appreciate what a great resource your site is. Happy vacation! I’m so excited you blogged about this. I have been feeling the same way, I just started getting back into making a lot of stuff from scratch and so happy to be doing it again. Not only is it keeping our budget down (which never hurts) But it is a time of relaxation and fulfillment for me to have made something from scratch for my family. I can’t really describe the feeling. I also Love Tammy’s recipes! I have made a ton of her stuff! I am so excited to hear your thoughts about the book as well! It looks like a really good one to me, that I may have to see if our library has! I love your blog it has helped me and my family a lot! Have a great vacation!! I have been making my own laundry detergent for about 2 years now. I love it! Here is a really easy recipe and it works for HE washers as well you just would use half as much. Mix it all together and store in a bucket with a good lid. Use 1-2 tablespoons per load. Makes 576 tablespoons of detergent and only costs about $15.00! @Cathy, I was hoping for a recipe for the HE washers. Has anyone tried this in a HE washer, and if so how did it work? Would I only use 1 tablespoon per load? I have purchased the borax, but where do I get the washing soda? @Deanne, I use homemade detergent in our HE and it works great. You can buy Arm & Hammer washing soda at alice.com or at Hyvee, if you have one in your area. @Deanne, Yes, I have a friend with a HE washer and she uses this recipe also. She really likes it and only uses 1/2 to 1 tablespoon per load. Washing soda can be hard to find. You can order it on line, or check Kroger. It would be in the laundry section. Where I live we can find it at Smiths and Macey’s. Good luck! @Cathy, I forgot to add that I have hard water and this recipe has been the best one for hard water that I have found. My all-time favorite “from scratch” DIY is my vinegar spray. One part vinegar, one part water and about 20 drops of vanilla aroma oil. I use this spray on windows, mirrors, countertops, floors (for mopping) and it is so cheap! With this spray and my trusty box of baking soda I haven’t spent a penny on conventional cleaners in years! Where do you get vanilla aroma oil? I love using the vinegar/water mixture but have never added a scent. @Jennifer, I use vinegar and water for my floors, but I’ll have to try it on windows and mirrors. I also use vinegar, water and a few drops of dish soap as an all purpose cleanser(bathrooms, countertops etc). @Jennifer, I do the same thing, just 50-50 vinegar and water and use it in the kitchen to clean the counters, stove and sink. So easy and inexpensive! Plus vinegar is a natural disinfectant. Check out the meteor shower tonight! We always took our family vacation at Lake Norfork during the second week of August. My sister and I loved to lie on the ground and watch the show! Should be apretty amazing show tonight! @Amanda, Our family goes to Lake Norfork every year. It’s been a tradition for over 50 years and 4 generations! I love reading that book! I have read it at least three times – I am always inspired to work hard in making my home more healthy and natural through simplification. We have been slowly taking baby steps towards the type of simplification that Brende experiences and attempts to add to “everyday life” at the end of his book. My blog is a collection of thoughts, reflections, and experiences with our experiences. Things that have gone very well are in a tab of natural living ideas. This summer I mastered making melt and pour candles and two different freezer jams. Next year I hope to master soap making and canning with both a pressure and water bath canner. Enjoy your new venture! I am excited to read along! I love DIY stuff, I’m kind of a DIY-er myself so I’m definitely looking forward to your new pursuits!!! Kefir is very easy to make, and very healthy! Once you have your grains (which you reuse) you really just spend the cost of milk. Kefir at the health food store costs somewhere around 3x the cost of milk, so this is a great deal! @Cara, Cara, I’ve been wanting to make my own kefir, but I’ve haven’t figured out the best place to buy the grains. Can you recommend somewhere? Also, Tammy, I’ll second the suggestion to make the laundry detergent as a dry mix rather than the gloppy, hard to store mix. I’ve been using it for about 4 mos, and there’s no comparison to the liquid detergent. Because I have an HE machine, I find that I still use about 2 T because the loads are so big. @Amy, I’ve gotten grains (and yogurt starter)from the website culturesforhealth.com and they have worked well they have great customer service. Can’t wait for the book review, sounds right up my alley! I just heard a song on my kids’ Pandora station that said, “You can do anything when you make everything from scratch.” Great words to live by! Thanks so much for this article and your blog. We recently down graded to one income now that we have a child, and have had a hard time trying to get the dollar to stretch. This has really put a lot of perspective on what can be done with a few things and living simply while being being content. Great link and I’ll have to check out that book. I just wished you hadn’t mentioned chocolate cake; now I want to go bake my favorite, Hershey’s Deep Dark Chocolate Cake with Buttercream Frosting. My daughter loves the Frappes at Starbucks, but they are EXPENSIVE so we’ll try Tammy’s recipe. My best friend has made the homemade laundry powder, and offered to give me some, but so far most of my store-bought laundry soap is cheaper or free, with the deals I get. And I don’t know how the homemade stuff compares, but my MIL uses Charlie’s soap, and we lived with her for a while, and my kids’ clothes had stains I could not get out, ever! Purex, no problem! I hardly even use Shout anymore. I stretch the laundry soap even farther by using only about 1/3 the recommended amount. Do you have a recipe for your all-purpose cleaner? Here’s a few of our recipes in Dining On A Dime. These might be a few to get started. *Growing your own veggies and flowers – nothing like the feeling of getting your hands in the soil in the spring. It’s a real mood booster. *Baking and kneading your own bread – very therapeutic. *Making brownies from scratch! I can taste the chemicals in the mixes. I use a recipe for a Betty Crocker cookbook c. 1990 which calls for cocoa powder and mixes up in 5 minutes. No melting chocolate, etc. Very easy and very good. So much better than those boxes. Our favorite brownie recipe is from the back of a container of Hershey’s cocoa. I’m not sure if its still printed there or not because we by generic or bulk cocoa now. I’ve had a ton of readers submit cleaning recipes to try (but no laundry yet!) But, I’ll tell you the absolute BEST glass cleaner around is rubbing alcohol! Everything (glass, chrome, etc) will shine!! It’s a good cleaner for granite countertops as well. Plus, it’s very inexpensive! Thanks for the link. Today I made homemade crackers for the first time. My toddler loves crackers and I hate giving her ones that have tons of ingredients. I think I will try to make the chocolate cake next and the cocoa mix will be a great Christmas gift. Oh, I can’t wait to see more on this topic, Crystal! As a SAHM who lives 40 minutes from CVS or any other great couponing store, I often feel like I’m sitting out on the game. But I console myself that I’m saving $$ when I make my own bread, grapenuts, laundry soap, can from the garden, tend my chickens, etc. etc. It’ll be fun to learn more with you!! I know what you mean , we live in our town and our borough council had a fit like we were absurd to even think we could have chickens! They said they are dangerous animal ( even if we kept them cooped up 24/7!) Crazy! I added that book to my wishlist. It sounds very intriguing! I love to make things from scrath – just for the fun of it. I think I’m addicted to it! Something I recently blogged about is making my own vapo rub. It is very easy (only requires two ingredients) and gives me peace of mind because it doesn’t contain petroleum! @Doreen, Coconut oil would be a great. I use it as a moisturizer on my face every day. Thanks for the idea 🙂 I’ll try this with coconut oil next time! Oops, I see I wrote make things from “scrath” instead of “scratch” in my last comment! Other fun stuff to make from scratch: Cleaners, lotions, bread, cakes, tea, playdoh, lemonade, and ICE CREAM! It s also fun to finish/paint your own furniture. Here are some great snack ideas adopted from many different healthful chefs. 1. Fresh green beans lightly soaked in braggs liquid anminos, hot sauce(opt. ), and little bit olive oil. 3. Dehydrated fruit and nuts are great snacks, as well as fresh fruit, veggies, seed, unsweetened carobs chips, etc. if you are trying to introduce them to toddlers, setting out a muffin tin and filling it with different snacks to a fun way to get them to try it out. 4. Ants on a log is another kid-friendly snack. Instead of the traditional celery and peanutbutter, use any nutbutter on celery and places little raisins as the ants. The combination of flavors are incredible, and I’m not a big raisin fan either, but it’s delicious! 5. Flaxseed Crackers: (homemade, really easy to do) Get a glass bowl, fill with however many flaxseeds you want(I have a big bowl and fill it about half full), and then cover seeds with water about an inch or 2 higher than seeds. Let soak over night. They will become jelly like a pudding consistency. If runny, put through strainer. Mix flavoring with seeds, anything you want. Ex. lemon juice, hot sauce, soy sauce. spread out on cookie sheet and put in oven lower than 150 degrees. For as long as it takes until crisp, could be up to 24 hrs. I use a dehydrator on a really low setting, to keep them “raw”. they are such a YUMMY and nutritous snack! Read that book a few years ago. Good read! I have been thinking along these lines too. The Lord has so graciously placed us amongst friends who are better at DIY than we are so we are learning alot. I would like for my children to know where their food comes from. Hey Crystal, We just sent out an email to you yesterday with a link to many of our make-from-scratch (whole foods) recipes, including making your own jam, bagels, crackers, etc. We have been on your site in the past for “how to’s” on chopping/ freezing your onions, and for making/ freezing baby food. We would love to be a resource on your site for this topic, since it is the direction Katie is going on our site! Check it out. Sounds good, Crystal! I’ve also been slacking lately in the whole make-it-myself realm, just because of busyness and tiredness, but I am inspired to get back on track more this fall with doing many of the things I used to do, and trying some new ones out as well. I just posted a laundry soap recipe and tutorial a few weeks ago, and am excited to try it soon myself. I’m going to be doing a review panel and comparing it to other “green” brands of laundry soap and seeing how it matches up– maybe I’ll be pleasantly surprised? I do dishwasher soap, vanilla extract, tortilla, bread and yogurt from scratch. @Jessica Lynette, How do you make your own dishwasher soap? We currently use Seventh Generation and love it. Would love to know more about making it myself! Ooh, and have you ever made peanut butter?!?! It’s so neat (your kids would love watching peanuts turn into peanut butter!) and it takes about two minutes. Two LOUD minutes…but still! Crystal- I’m interested to read your book review. I wrote a post a few months ago about getting a brighter whiter smile without tooth whiteners. It’s pretty effective and its more about your method than the chemicals. I shared a great post on how to make your own home-made baby wipes! I have made them myself and they are wonderful. They smell great and if you use the right paper towels they hold up very well. its nice to know you can make something like this homemade. Maybe you already do this. But soaking and cooking your own beans is a cinch, not mention cheaper and healthier. And whatever I don’t use at the time I just freeze in two cup portions…then when I need a can, I can just go to the freezer. I have 2 teenage sons that play football. Right now they are practicing 2 times a day in the humid heat(Louisiana). They need to be hydrated and they want to have gatorade to drink. This is a big expense!!! I found a homemade version of gatorade that actually taste better than the real stuff and costs pennies for a gallon. This is how I make it in bulk. For my first child who is 7 months now my husband and I decided that we wanted to use cloth diapers for him. This has been wonderful! Many people ask how much work it is, but it really isn’t more than doing some extra loads of laundry a week. It really isn’t that much extra work at all! It has saved a lot of money in the long run too. We then thought, well we use cloth diapers, why not make our own wipes too? So I cut up a bunch of old t-shirts and just was the wipes along with the diapers. To make the wipes I just boil water and add some baby shampoo and mineral oil. I had also gotten a free sample of tea tree oil and add a small drop of it too. And these wipes don’t necessarily just have to be for baby’s bottom. You could add different things to them for cleaning or stash a container in your purse. I do my own spray n wash. My kids are so hard on their clothes, and this seems to get the brunt of it. I go through it so fast, this is great. I reuse an old bottle and keep the rest in an old detergent bottle re-labeled. Weed killer that is environmentally friendly is 70 vinegar / 30 water mixture. You spray it on your weeds just a handful of times, and the weed is gone and dead. It is much cheaper than, that expensive and hazardous weed killer from the stores! We must have super weeds. We sprayed straight vinegar on them and they still keep coming. At one point we got desperate (weeds can get you fined by the city here) and mixed up the poisonous stuff at DOUBLE strength and the weeds still keep growing and coming up. I’m such a canning geek that these types of discussions always have me shouting Oh! Make some pickles! Try the jam! It’s easy! Once you get the process down it’s a short leap to salsas, sauces, special condiments (great gifts!) and more. I admit that canning is not always the cheapest, most rock-bottom cost way to obtain food, but it’s an excellent way to have best-quality food at very good prices. Plus, it’s excellent stewardship of abundance and green to boot! 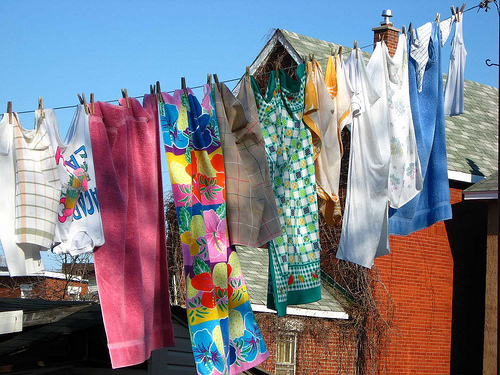 I have always used a clothesline to dry my clothes (weather permitting, all but the unmentionables) and you would be surprised how satisfying it is to dry your clothes this way. I don’t do it to be environmentally friendly, I have always done it to (1) save money, (2) it’s therapeutic! I follow you and Trent Hamm at the Simpledollar.com you should check out his reciepe for homemade laundry detergent he swears by and he has had a lot of postive comments from others who have used it. My husband thinks in the fall we are going to take the plunge and do it too! How about fixing your own stuff instead of buying a new one or going to a repair shop? I have started doing a lot of my own car maintanence (thanks, Dad!) and recently replaced a chewed-off vaccuum plug, a broken light switch, and rusted up door lock. There are tons of DIY repair tips on youtube and elsewhere online. It has saved me big $$$ recently. Hey, I was wondering if you would post your thoughts on P90X….I am finished with my childbearing years….four babies and still nursing my 19 month old. I do not trust pill based weight loss programs and have a hard time leaving my house to “exercise” with the kids. I have 100 pounds to lose in order to be near my target weight since having kids and losing my dad to cancer 6 years ago. Do a search for “P90X” on the sidebar and it will pull up my posts on the subject. I’m a little over 20 days in and loving it — though I am not doing it for weight-loss (I’m at a healthy weight) but just to become healthier and stronger. For anyone looking for a great website for making food from scratch, Heavenly Homemakers is wonderful!!!! Her recipes are easy and have lots of helpful pictures. 🙂 And she has lots of helpful information on freezing everything! My favorite ones are chocolate chips, pizza pockets, bagels, turkey sausage, graham crackers, and cream cheese. Yummy yummy yummy! I would have to say…that making my own laundry detergent has been one of the best frugal discoveries I have ever made! I figured that $13.82 is all it takes to buy the supplies to make about a years worth of detergent. Awesome! I buy all of my supplies at WINCO (borax, super washing soda, and bars of Nels Naptha soap) I do about 18 to 21 loads of laundry a week. It is well worth finding a recipe that works for your family. I believe I found my recipe on hip2save.com. I also use a bar of Nels Naptha soap as my stain remover stick. Pre-treat your stains by wetting the tip of the soap and then just rub on your stains. I know you do not use a lot of disposable products. I’m trying to use more dishcloths rather than disposable cloths and sponges for my dishes. However, I find that if I don’t get them in the wash right away they stink. How do you avoid using your washing machine to wash just a couple dishcloths and keeping them from smelling up the kitchen? I stick them straight into the laundry every 2-3 days. Since I usually run about 5-6 loads of laundry per week and do laundry about 3 times per week (usually one load every other day or so), I just stick them in the laundry when I start it (our laundry room is right off the kitchen — which is so nice!). I’ve *rarely* had a problem with them smelling this way. @bran, I know you asked Crystal, but I have a couple of suggestions for you. Put your dish cloths in the microwave before you hang them out. You could also put the dish cloths in your diswasher whenever you run a cycle of dishes. Hmm, I hadn’t thought of the dishwasher! Good thought. skinnytaste.com has a slew of great healthy recipes. I have been making homemade laundry detergent for about 9 months. It seems to cost about $1 a month this way. I have three people in my family. However, I noticed my laundry stinks sometimes, especially lately. (I make the powdered kind). Does anyone have any tips for me? I am seriously thinking of using purchased detergent again for a while. Thank you. PS I use essential oils sometimes and that doesn’t seem to help with the smell. @Chris, Is it a musty, moldy smell? When we got our HE washer, we noticed that our clothes sometimes came out smelling that way, no matter what detergent we used. Apparently, this is a very common problem. Try adding vinegar to the fabric softener dispenser. Our clothes have smelled great since we started doing that. Having a similar problem. We’ve been using soap nuts for over a year and my clothes are coming out of the laundry still smelling sweaty. We use vinegar and tea tree oil in the laundry, but I’ve switched back to commercial free and clear detergent for a while to see if that helps. Hi Crystal, I just wanted to comment on your soap making. I have a couple tips that might help you. I have made this a lot and feel like I have perfected it. I have seen some of the videos on how to make it and they look gloppy and gross. My soap is smooth and creamy. I use ivory, washing soad and borax. Before I melt the bar soap I grind it in my small food processor then after the mixture has cooked and cooled (usually the next morning) I add a little more water then use my stick blender to cream it up. I make sure it’s really blended and smooth then I put it in a container. I make it in one gallon batches because if you let it sit it will separate. This is great for HE washers as it is low suds. Good luck. I really like the soap and feel it really gets the clothes a lot cleaner than store bought ones. PLUS it’s good for the environment. I’ve just started trying to make a go of it without paper towels. It wasn’t too bad until the cat AND the kids started puking. Ah… the joys of motherhood! Looking forward to your list! @Amanda, oops commented on the wrong post.